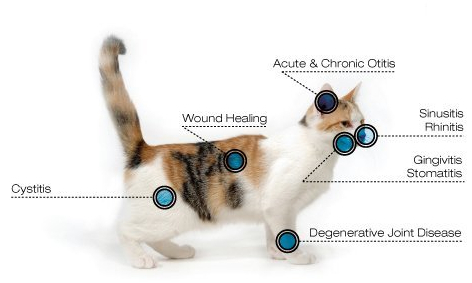 We are excited to introduce Companion Animal Laser Therapy as a noninvasive treatment to reduce pain, increase speed of healing and decrease inflammation. 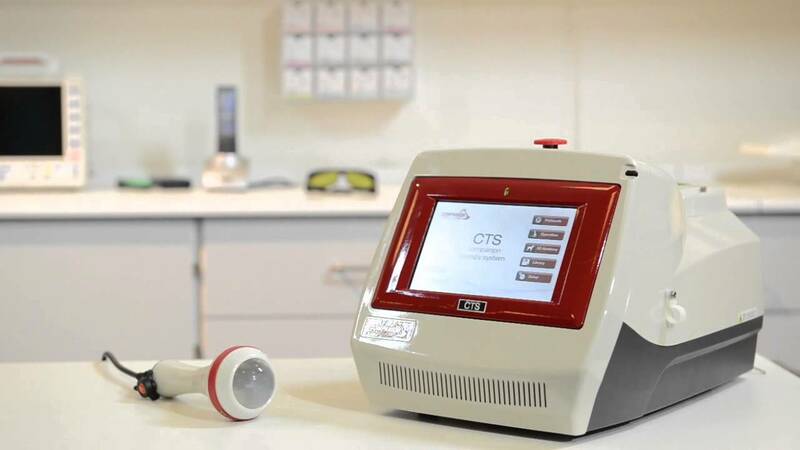 Laser therapy can be used in conjunction with medications to manage pain and infection. Our laser is safe in dogs, cats, and horses. Our laser is a class IV deep tissue laser. It works by penetrating deep into the tissue, without causing damage. The energy it emits, triggers a biological response called “photo-bio-modulation.” This occurs on a cellular level which reduces pain, inflammation and increases blood circulation and the speed of recovery. The laser light is delivered through a hand piece, treating the affected area. There is no pain involved, only a mild, soothing warmth at the area the laser is being used. 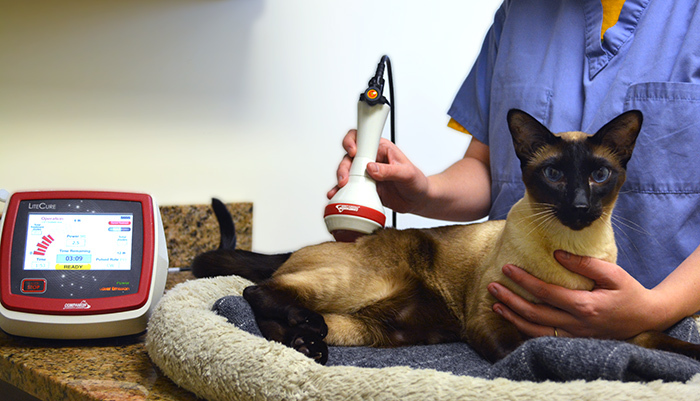 As most treatments only take a few minutes, many pets, even if normally nervous or reactive at the vet’s office, quickly relax and even seem to enjoy the warmth and massage that the laser provides. 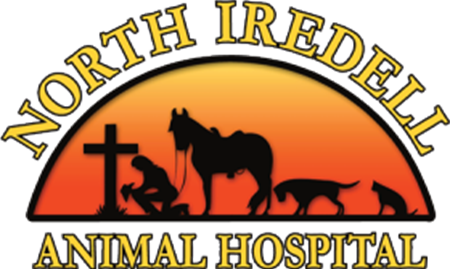 Each site on your pet only takes a short amount of time for the procedure to be performed, so you can wait while it is done. Q. Will my pet need anesthesia? A. No, Most animals relax while getting their treatment. Q. How is it given to my pet? A. The pet lies on the floor and we do the rest. It is a light admitting hand held piece that we hold and continually move over the problem areas. A. 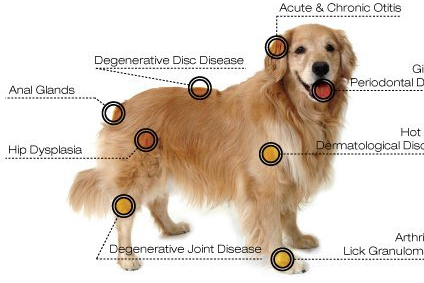 This technology is the latest for animals that have joint and soft tissue problems. It can dramatically shorten the amount of healing time after surgery or procedure. The treatment may reduce or eliminate the need for medications. Q. What if my pet has a chronic condition? A. Chronic conditions may require a few more treatments and maintenance treatments may be closer together to maintain the reduced pain and mobility. Q. Will it hurt my pet? A. No, the laser produces a slight warm feeling in the area being treated. A. Treatment times vary depending on the areas affected. They can be as short as 5 minutes and can take as long as 15 for multiple areas. I have a 15 year old Wheaten Terrier who recently developed degenerated discs in his back. My vet recommended laser therapy for him and let me tell you it’s like they hit the reset button. He’s walking and jumping he’s going up and down stairs no problem. If you love your pet DO IT!!!! it’s worth it!